In the heart of a Peruvian nature park, the Alto El Sol plantation is protected by a lush environment, giving the cocoa trees all their richness. The dominant sourness and red fruits give to this dark couverture chocolate a very long lasting taste. E.U. Certified organic. 3 drop fluidity. Suitable for moulding, enrobing, and making chocolate tablets and bars. 65% min. 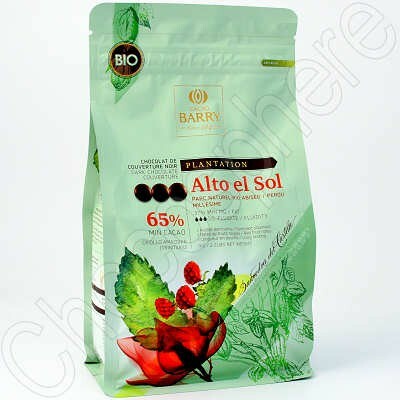 cacao, Criollo Amazonia (Trinitario) Packaged in a strong zip-reclosable bag. Certified Kosher-Dairy . 1Kg/2.2 lb net wt.